One of my favourite cafe breakfast is 'chaan dan tung' 餐蛋通 to wash down with 'yin yan lai cha' 鴛鴦奶茶. 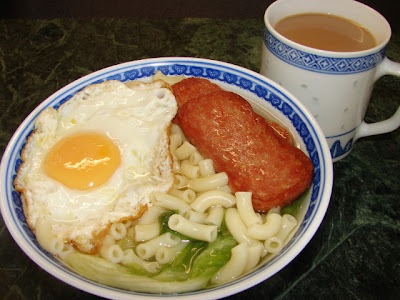 Chaan dan tung is macaroni soup with fried spam and fried egg, while yin yan lai cha is a milky tea with coffee. Both sound very strange but really quite tasty and reasonably cheap. Here is what I do to recreate this at home occasionally for weekend late breakfast. Heat the stock add cooked macaroni and seasoned to taste then top with fried spam, fried egg and some veg. Blew some tea, preferably Lipton, Ceylon red tea or any far east brand English tea. If not use normal Tetley or other English tea. Mix 50:50 brewed hot tea with coffee add plenty of hot milk or some evaporated milk. Evaporated milk gives a distinctive S E Asian tea/coffee taste. I don't normally add sugar to tea or coffee but yin yan tea coffee is nice with some sugar. Yin Yang tea coffee is nice too cold with plenty of ice. If you fancy you can add crushed iced, black pearls to make bubble tea 珍珠鴛鴦奶茶, serve in a tall glass with extra wide straws. This makes me really nostalgic - I used to have this macaroni soup all the time! (followed by a dan tart or a chocolate sponge triangle...). My grandmother used to make tea with condensed milk, I miss it a lot. To me Hong Kong is a food mecca. What I like most for breakfast over is congee with you jiao wrapped in white crepe like noodle. I agreed HK is the far east food mecca but can be expensive compared to other S E Asian countries. Zha Liang (crispy you tiao wrapped with rice sheet) is luvvly. I can kill a plateful now :)..